The grandchildren had opted for a visit to Zoodoo, not far from Richmond (southern Tasmania), a few weeks back. I have a somewhat ambivalent attitude towards zoos, but concede that for the children, it's a great day out. Our ritual when we're in the Richmond area, has to include a visit to the local bakery for lunch, followed by a visit to the sweet shop and then on to the "bridge" to see the ducks. The day had proved to be unusually mild and the village was choked with people and parked cars. The bakery was full of like-minded visitors all vying for the diminishing choice of pies and sandwiches. Not my scene at all, and I couldn't wait to move on. I hadn't felt the best from the outset and my patience was fast running out. I avoided going into the crowded "old world" sweet shop, giving the grandchildren some money instead, and warning them of the dire consequences of spending more than the very modest limit I had set. On to the bridge and the ducks. For many visitors to the village, Richmond Bridge is the one "must see" site. Completed in 1825, it's the oldest bridge in Australia that's still in use. It's showing its' age. The grandchildren spilled out of the vehicles and ran down the grassy banks to the river. A photographer was ushering a wedding party into position, while other visitors took the inevitable images of the view through the bridge arches. I tried to relax by the vehicles, keeping a watchful eye on the young ones. A chainsaw roared intermittently nearby as did a number of lawnmowers, a group of bikers crossed the bridge, briefly raising the noise level to new heights, but even amongst all this hubbub, I suddenly became aware of the unmistakable sounds of a bird persistently calling-- an Australian Reed-Warbler. The day took on a whole new perspective, my spirits raised. Amazing what one small, as yet unseen, bird can do! 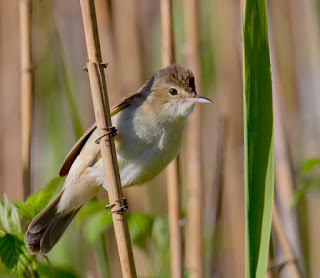 I strode down to the river bank about 50 metres away and listened, trying to locate the calling bird among a small area of phragmites reed on the opposite bank. A Tasmanian Native Hen swam towards me, 'escaping' an off lead dog. A Little Black Cormorant nervously passed, diving after unseen prey. A Black Duck ushered her youngsters away from me and a single Eurasian Coot sought refuge among the reeds. The reed-warbler sang on, still hidden among the reeds. An eel rose, taking bites out of passing slices of bread thrown by visitors, and Welcome Swallows collected mud for their nests from the river bank--and the bird sang on. 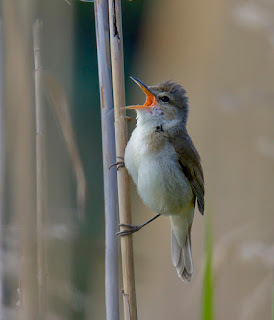 Finally, it appeared on a stem on the outer edges of the phragmites clump, giving me my first view, still calling, with its' rich, rasping notes now seemingly drowning out all other noises around me. A great moment. A few days later I returned to Richmond and took the accompanying images. It required rather more patience than I can usually muster and had its' moments of sheer frustration. From my observations, it appears that 2 pairs of Australian Reed-warblers were present. This species is not rare in Tasmania, but is fairly thinly distributed in the south. Most are summer migrants to this state, but on bright sunny days in mid winter, I've heard them calling in the Tamar Marshes, probably the stronghold for this species in Tasmania. Gould's Lagoon at Granton was for many years the "surefire" place around Hobart to see them, but in the last few years they have been almost absent. 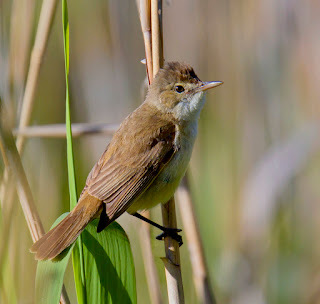 A single bird, late last summer, is my only record from there for the past 2 years.